By taking these Chanoyu lessons I hope to come up with a date(s) and time(s) I will serve tea to whom ever may wish for a cup. Whether this takes place at High Park at the peak of Cherry Bloosom Viewing or on the busy streets, I am still working out. The meanings behind each location and the tools I will use need much thought. Will I dress in Kimono, my usual attire or perhaps "change" to something else? Questions questions questions. Much learning on my part as an artist as I have only done Performance art a few times. Once I wore my modern kimono down town to class (it was black with an IPod design on it) and the other was cosplaying as my ego for a large school project. I have been a little busy putting things together for some submission deadlines. Writing, documenting, editing etc. Although I was eager the other day to start and almost finish these works. I am very pleased with the simplicity of them. 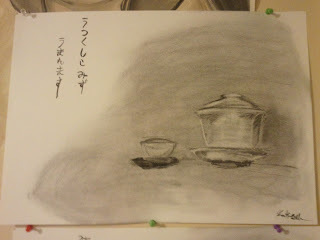 This "Tea" series will continue for some time to come. 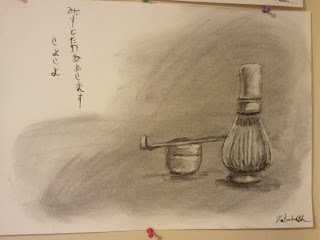 On a side note I am also going to begin learning Japanese Tea Ceremony starting this Saturday. I am eager to learn "茶の湯” or Chanoyu. The long Zen Buddhist and cultural history interest me so much it was a must to begin these lessons. There was a book I saw the same day as these pieces were made at Japanese Things (Harbord St, Toronto) which went over the history and context for it, this book will soon become part of my tea book collection. I also started two more elongated paintings but they are still being worked on. Building up the tea stain on it is a process I am still learning. These paitings have more colour but will not feature any Japanese writing. I have also begun to knit again, reteaching myself basics through a hat, arm warmers etc for the coming winter. Once these skills are back in place I will fully begin Hysteria II. As for the grid, I am working on cleaning my room so I will have space to work on it and other works at the same time. I found an easel near Queen street, so this will be put to good use (Sorry Matt, I'll help you set up my other one in the basement studio).